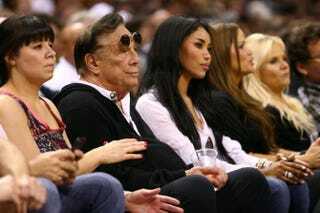 V. Stiviano (third from left) sits next to then-NBA team owner Donald Sterling while watching the San Antonio Spurs play the Memphis Grizzlies during the NBA Western Conference Finals in San Antonio May 19, 2013. Shelly Sterling, the estranged wife of disgraced, former Los Angeles Clippers owner Donald Sterling, is owed $2.6 million by V. Stiviano, her husband’s alleged mistress, a judge ruled Tuesday, the Associated Press reports. According to the news wire, Judge Richard Fruin Jr. decided that Shelly Sterling is due money and gifts given to Stiviano that he ruled community property as part of the Sterlings’ marriage. The gifts, the Los Angeles Times notes, included $800,000 in luxury cars, a $1.8 million home and other cash gifts, which are to be turned over to the Sterling Family Trust. Stiviano tried to argue that the gifts were made when the Sterlings were separated, but the judge disregarded the claim. Mac Nehoray, Stiviano’s attorney, said that he and his client plan to appeal the ruling, which is currently tentative. The judge gave both parties 15 days to file objections or ask for changes before the order is finalized, the Times notes. Read more at the Associated Press and the Los Angeles Times.